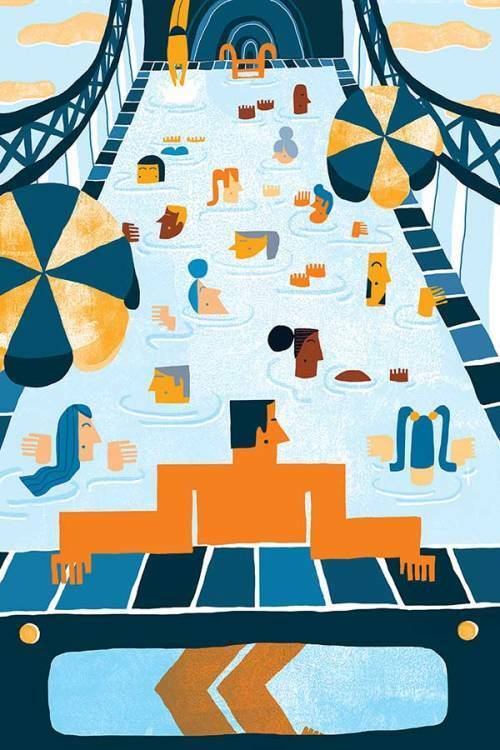 I'm a loyal visitor to the annual Prize for Illustration exhibition at London Transport Museum. And each time I reel off a list of my favourite pictures. So this year I thought I'd try and look at the exhibition differently. I wrote down a list of the qualities that I look for in an illustration and tried to identify one image that satisfied each quality. Conveniently, it still allowed me to show off lots of my favourite images! 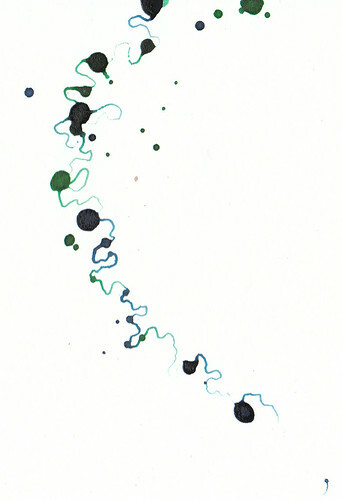 And to the left, my favourite image, And it Poured, by Ashling Lindsay. I loved Carrie May's depiction of London as a jungle, with familiar city objects tucked between leaf fronds as if they were wild, rarely spotted animals. As an absolute sucker for beauty, the shortlist for this category was long, and in the end I just had to choose two pieces. Ciaran Murphy's mix of colour and monochrome, and utterly familiar and loved place, distortion of size and hint of narrative drew me in. And I loved the multiple layers as well as the mix of textures, print, abstraction and familiarity in Esther Cox's Beneath. 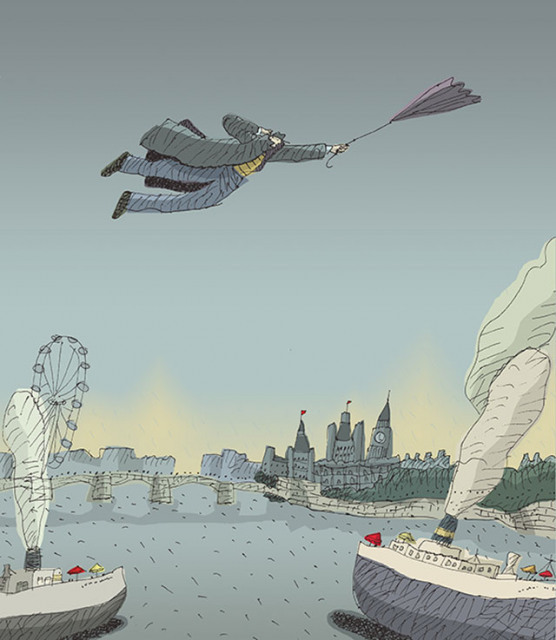 I was tempted by so many others but at the end of the day, London Fly by David Pintor just takes me on a lovely imaginative journey. Laugh out loud humour wasn't really an exhibition feature, and this should perhaps be rated for it's concept, but I just couldn't help smiling at the idea of combining an open top bus tour with Brockwell Lido. By Beth Walrdond. Living Together by Emily Nash seems to have it all ... all these different people living right on top of each other, with our fruit stalls, laundry, bicycles. 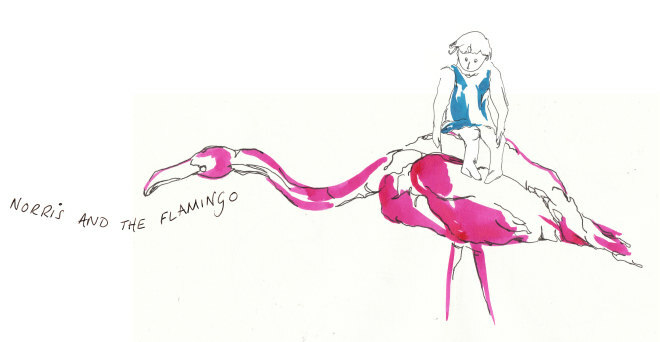 Illustration is first and foremost for children, after all. I looked for a picture that might catch the magic of childhood, if not directly aimed at children. I couldn't resist Fountains by Emma Reynolds, not least I think because some of my fondest childhood memories involved getting very wet! Drawn as I often am to monochrome illustration, it's largely the challenge of selecting the right colours that intimidates me. So I looked for someone who did it well. 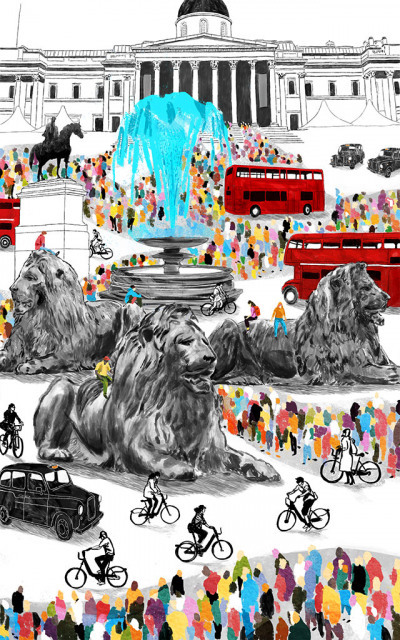 Mouni Feddag's London is an intriguing combination and the richest celebration of colour that anyone could ask for! So many illustrations these days are finished off on the computer that a few really stood out to me for the bravery of exhibiting the work in its original materials. 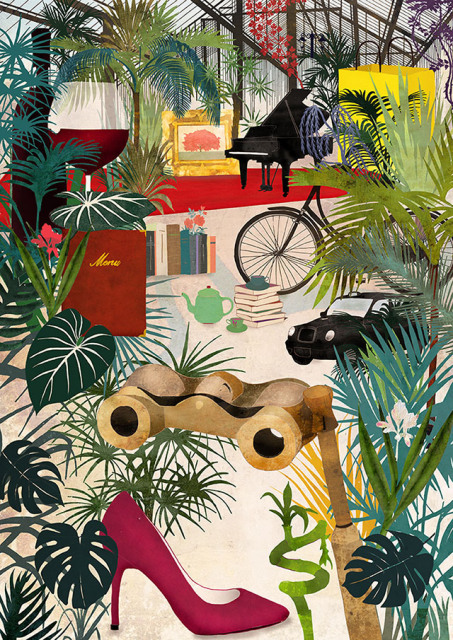 I loved this collage - The Horniman Museum by Miranda Sofroniou - a true, tactile, original piece of illustration. I'm so grateful that there's space in this world for computer-free artwork!